Here is a picture of 70-2 rally gage. This set-up uses special temperature and oil senders. 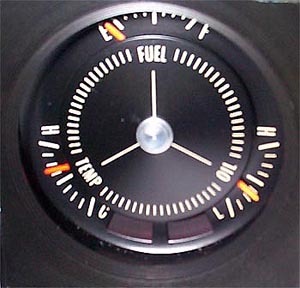 Here is a top view of the rally gage. 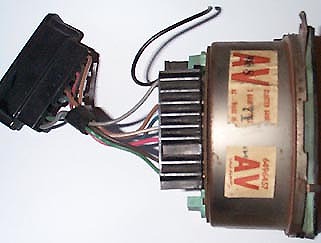 Attached is the 6" factory adapter harness which plugs into the main wiring harness. This adapter is often forgotten since most people remove the gage and forget about the adapter. Also notice the black wire at the top. This wire grounds the unit to the main harness. It has a separate spade on the back of the gage. Idiot lights do not have this feature. Arrow in lower left corner points to date code on the rally gage package....this one is 9 69 and was in a 70 GS455. Notice second arrow above it....ground tang is missing when compare to the 72 unit pictured above. My understanding is the ground tang is for the "FASTEN SEAT BELTS" warning light that is mounted on the dash pad for 72 models. Ground strap for the rally gage which shares a ground with the speedometer. 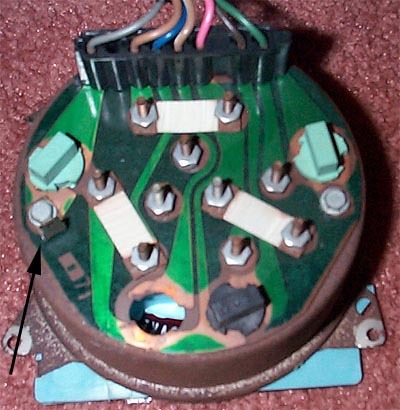 The harness for the speedometer has a ground wire from the main harness. It should take about 5 minutes to rearrange the wiring. 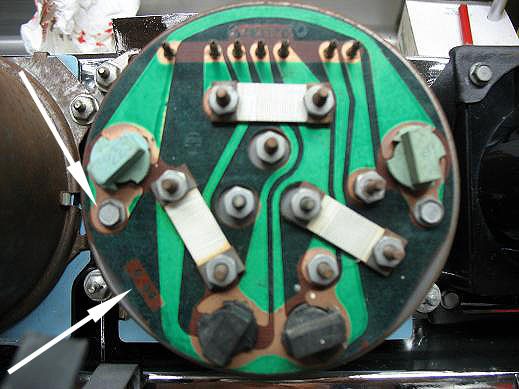 Disconnect the dark green wire at the ignition switch on the lower column. This was set-up to test the temp. lamp upon start up. Disconnecting it will prevent the gauge from spiking during start-up. Oil pressure gauge sending unit, Echlin Part number OP6650, available at NAPA, rated at 80 PSI. I install the rally gage in my cars but install an aftermarket set of gages such as Autometer to get an actual numeric reading. I can't tell what 3/4 of H means so it is nice to read an actual water temp of 180 degrees or for oil pressure, 60 psi. Sometimes the factory gages are not very accurate and I prefer an aftermarket set to monitor engine parameters.